We have reached a stage of the year best described as “seasonal confusion.” It feels a little bit summer, a little bit fall, and 100% a reason to sip a frosty Pumpkin Milkshake. On the summer side, I never want to put away my flip flops. I’m still savoring fresh tomatoes, and I might just cry when the last juicy peach leaves the produce shelves. At the same time, however, I’d be fibbing if I didn’t admit that these Vegan Pumpkin Muffins and this Pumpkin Granola have me craving warm fall flavors. Last night, I confronted both seasons in the middle of my bedroom floor. I returned from a foodie trip to Columbus, Ohio (check my Instagram feed for the highlights! ), then this morning, less than 24 hours later, I departed for a wedding in the Colorado mountains. I was home exactly long enough to repack my suitcase and confirm that my dog still knows who I am. The breezy tops came out of the suitcase; the scarves went in. As I folded my flannel shirts and sweaters, I felt a familiar tingle: the excitement for fall. Every year, I feel guilty rushing fall, because summer feels so short. Can’t I have my fall and my summer too? This Pumpkin Milkshake recipe says YES. It’s the cozy flavors of fall transformed into a cool, creamy treat that’s perfect for these last warm days. 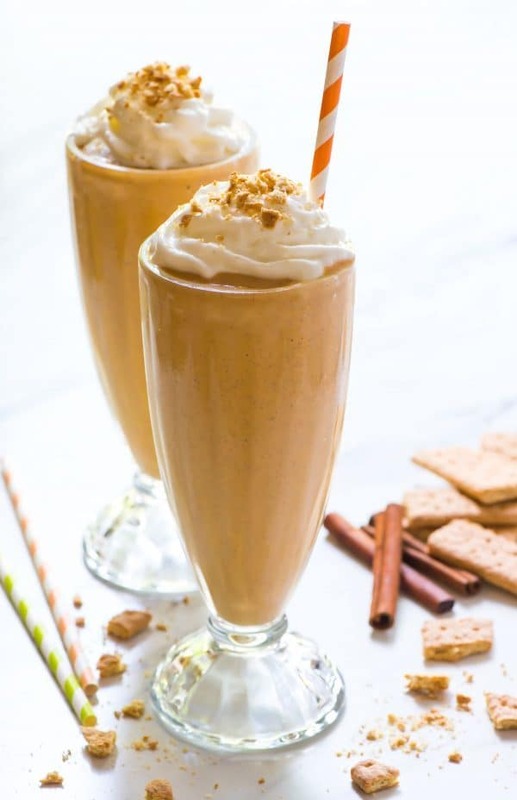 A lightened-up version of a pumpkin pie milkshake, this healthy pumpkin shake recipe tastes anything but! Frozen banana. My trick to making the shake taste thick, creamy, and sweet, and sneaking in a serving of fruit at the same time. I tried the recipe both with and without it, and I definitely preferred the version WITH the banana. It was sweeter, frostier, and the banana flavor was nearly undetectable. All you’ll taste is pure pumpkin spice bliss. Graham crackers. The “crust” to this yummy pumpkin pie–inspired dessert. Kemps No Sugar Added Vanilla Frozen Yogurt. A freezer staple in our ice-cream-loving household. I was first introduced to Kemps when I moved to Minneapolis after college graduation. The company began as a small family creamery in southeastern Minnesota and has since expanded throughout the upper Midwest, including to my current home state of Wisconsin. I first bought Kemps products for their quality and taste. Since learning about the company’s commitment to sourcing its milk from nearby local farms, I also buy them because my purchase supports my community. Kemps gives 100% of its profit back to dairy farmers and their families, many of whom you can read about here. I find Kemps at Pick ‘n Save (the grocery store nearest my house), but it’s widely available across many retailers in the upper Midwest. When Kemps asked me to develop this Pumpkin Milkshake recipe to share its “Good Comes Around” message, it resonated with me right away. By sourcing high-quality milk from nearby, Kemps can provide fresher, better products to you and me. The profits from those products then go right back to the community, and the cycle begins again. It’s a rewarding model for all involved, a point on which I am happy to reflect while sipping a Pumpkin Milkshake! 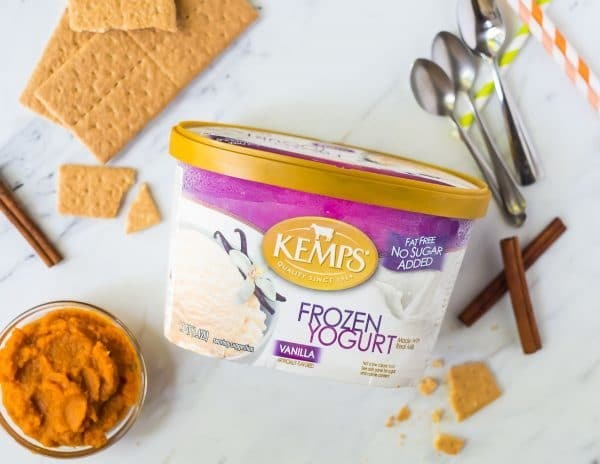 I selected Kemps No Sugar Added Vanilla Frozen Yogurt because it’s creamy and smooth, and at only 70 calories a serving, it’s a healthy way to satisfy my sweet tooth. It’s also an excellent canvas for all manner of sundae toppings, a mandatory addition to my Pumpkin Pecan Cobbler, and of course a key ingredient to today’s Pumpkin Milkshake. You’ll never suspect that this recipe is made without ice cream. This Pumpkin Milkshake takes less than five minutes to throw together, is easy to scale up or down, and is an excellent way to use up any bits of canned pumpkin you have leftover from other baking recipes too. Cheers! Healthy Pumpkin Milkshake. Like pumpkin pie in a glass! A yummy fall dessert made with frozen yogurt, pumpkin, and warm fall spices. To a high-powered blender, add in order the pumpkin puree, milk, banana, frozen yogurt, pumpkin pie spice, and cinnamon. Break the sheet of graham cracker into a few pieces directly into the blender. Blend until smooth, adding more milk 1 tablespoon at a time as needed to reach your desired consistency. Divide into glasses and top with additional crushed graham crackers and whipped cream. Sip immediately. This sounds absolutely delicious! We’re all so concerned with lattes that I’ve never thought out a pumpkin milkshake before, great idea! Thanks, Kelly! The lattes are delicious, but I think milkshakes are perfect for when we’re still holding on to summer! This milkshake looks amazing. Definitely something I will try, just going to pop some chopped, bagged bananas in the freezer. I feel the same as you. Our summer here in England is always a bit hit and miss. Yet this year by mid August, Autumn seemed to be creeping in, only to have sweltering, humid heat at the end of the month. I wish I had had this recipe then! seasonal confusion. Haha yes, I get it! But I say bring on the pumpkin. This is the perfect transitional drink! This looks unreal! I need to try this! You had me at pumpkin + cinnamon! Sounds delicious especially with the crackers!! This is crazy – I went to college in Columbus and then moved to Denver where I was for 4.5 years! You must (MUST) hit up The Mercantile in Union Station while you are in Denver. I am not exaggerating when I say it is some of the best food I’ve ever eaten. I hope you get a chance to try it! Shannon, how funny! And GAH, Mercantile was on our list, but we ran out of time. I must try it next time. We’re already planning to come back! This looks delicious, and you are so right about “seasonal confusion”! oh yum!! I’m feeling the pumpkin right now! This sounds exactly like me! Not quite ready to give up summer, but sort of ready for flavors of fall. I think this is an excellent recipe to accomplish both. Plus being here in Madison, I’ve had Kemps and have always loved it! Suggestions to make this dairy free? Looks yummy! 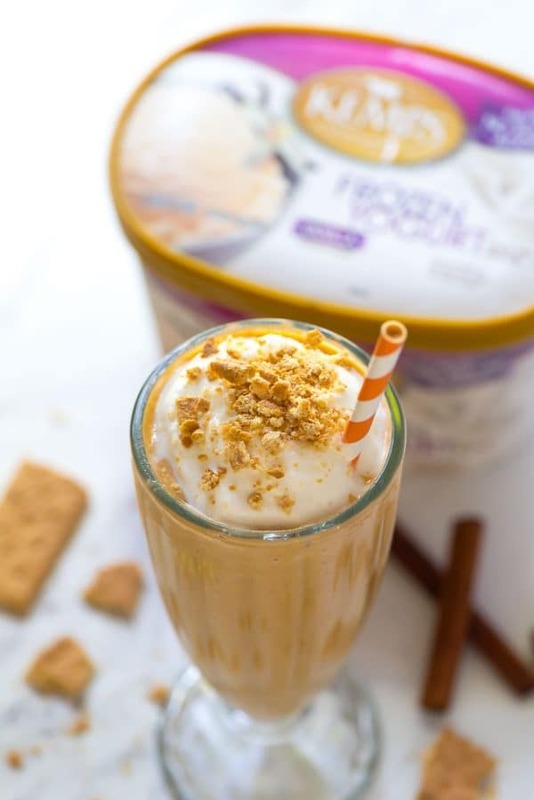 Hi Fran, I haven’t tried making this dairy free myself, but you could try this recipe using your favorite dairy-free vanilla ice cream and whatever type of nondairy milk you prefer! So, we ne Ed to buy a pumpkin and cook it to get Purée? Can not use Pumpkin pie filling? May be too labor intensive for a milkshake, even though I really like Pumpkin flavor and they are quite nutritional! Sandy, you can buy pumpkin puree! That’s what I used. Pumpkin pie filling comes pre-sweetened with other ingredients. What you want is pure, canned pumpkin. I hope you love it, Sandy! 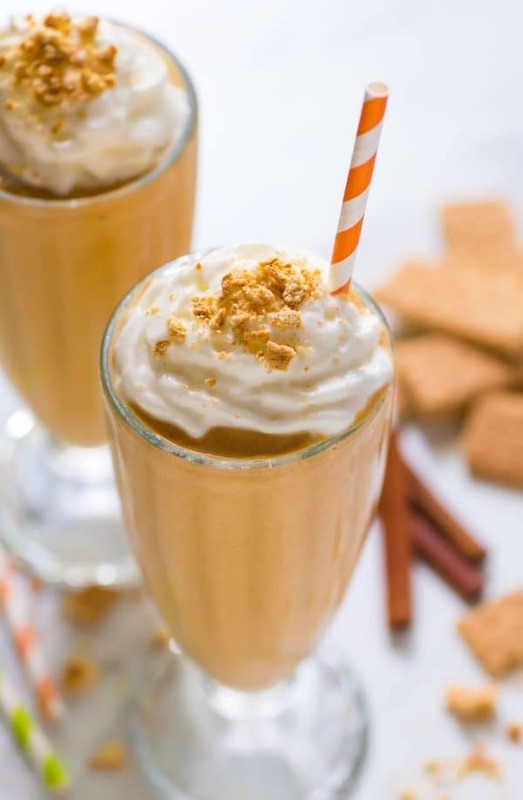 I’m going to make this pumpkin milkshake my FIRST pumpkin treat for Autumn!! I hope you love it, Helaine! the perfect way to say “goodbye Summer……hello Fall! This shake is calling my name!! Great idea! This is sooo perfect for fall! Yes, yes and YES! This is happening ASAP. Hope you love them Kelly! Made this last night when I was craving something sweet after dinner. Quick, easy, and absolutely yummy! Could I use frozen plain greek yogurt sweetened with a bit of stevia in this recipe instead of the kemps frozen yogurt? Hi Helen, I haven’t tried it that way, so it’d be an experiment! I’d taste as you go and adjust sweetener as needed. I hope you enjoy!